In those forums where you can not open new topics ("TC Fixed bugs", "TC Behavior which will not be changed", and ""Bug reports from previous betas (unresolved)") you can no longer use BBCode in answers to a topic - see: https://www.ghisler.ch/board/viewtopic.php?f=16&t=50473#p345345 where I manually inserted the BBcode - but it is not rendered. Also the users signature is not shown either. If I open the "Full Editor & Preview" - there are NO formatting tools and it says "BBCode is OFF" in those 3 forums - very inconvenient. It is with all 4 themes - so it is probably not theme related. Re: New forum active now! I've just noticed that there is no more link to https://www.ghisler.com/ in forum header! On my mobile (standard prosilver theme), the poster is shown without the * (which is fine, this is how it's done in all other forums). The most important thing though is that "Ghisler" is shown in red, since he belongs in the Admins group. This does not happen in the standard (non-mobile) theme. All accounts are always shown in blue. Strange, I see ghisler(Author) in red here. see: https://www.ghisler.ch/board/viewtopic.php?f=16&t=50473#p345345 where I manually inserted the BBcode - but it is not rendered. 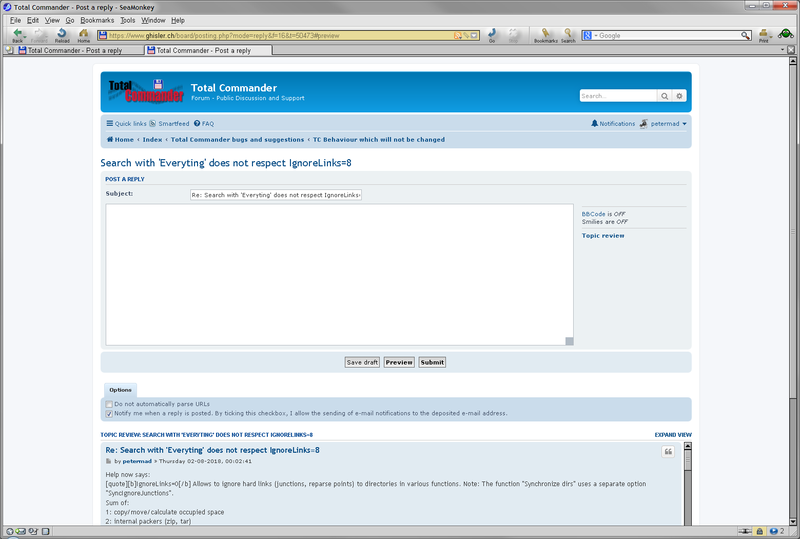 This is now rendered correct - But I still cannot use BBcode in the editor in that forum! It should work now, please try it! Yes, BBcode works again in "TC Fixed bugs", "TC Behavior which will not be changed", and ""Bug reports from previous betas (unresolved)" - thanks! Preview a post is out of mobile screen when the board style is AllanStyle or prosilver (left) and the screen isn't wide (vertical mode), other styles are ok even when the screen is vertical. Fixed with a little css, thanks! Does this imply that we have to find a post by Author Ghisler and locate www.ghisler.com at the bottom [sic], and use that to go straight to the main TC site? ..or is it a reply to another topic? The *ghisler(Author) object on the left in red takes me nowhere. The one on the right takes me to a profile. 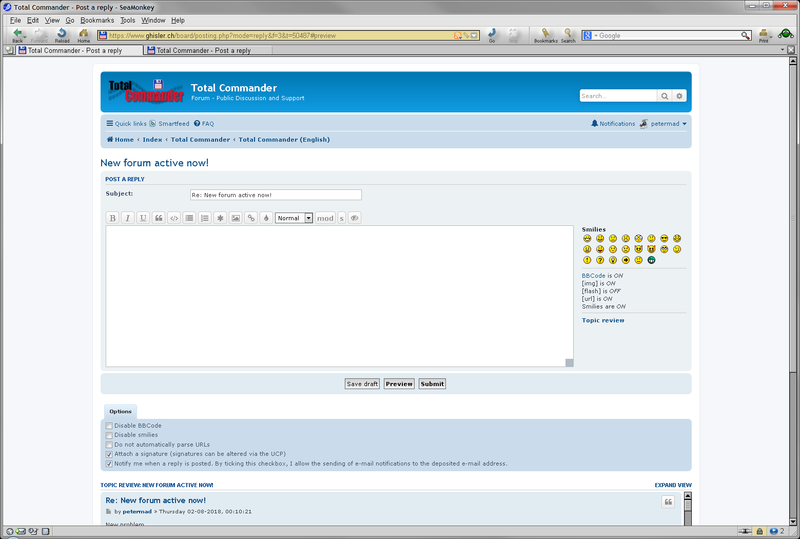 That's rather a widdershins way of doing what use to be a click on the 'Total Commander' title at the top of a forum page, isn't it?